Sponsored by Longboard – A division of Mayne Coatings Corp. Describe how the incorporation of natural-looking wood elements in the built environment can have a positive impact on occupant productivity and overall well-being. Identify key variables contributing to the significance of facade cladding systems in design, durability, and sustainability. Explain how a building can positively affect workplace performance, and how natural-looking metal cladding systems can make anxiety-producing public spaces more comfortable and inviting. Evaluate the cost-benefit impacts of using low-maintenance metal cladding systems with a woodgrain finish in terms of first costs, long-term maintenance, and payback on human factors. The debate continues: Hard modern versus soft modern. Humanizing architecture or a futuristic vision. Increasingly, architects are opting for building designs that heal, addressing today’s predominant social issues. Many see a chance to help people feel better about themselves and their places, to encourage a greater sense of community, and even to enhance psychological well-being. Behind the movement are recently established but confirmed areas of study, such as evidence-based design (EBD) to improve health outcomes, applications of biophilia to exploit human predilections for nature, and daylight as a therapeutic design element. One outgrowth of this trend has been the conclusion among many architects that people respond positively to the look and feel of natural materials, such as wood finishes, patinated metals, and the patterns in cut stone, among others. 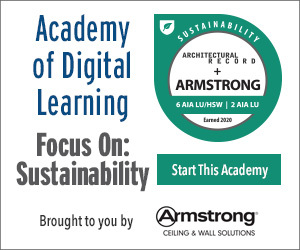 As this course demonstrates, new data and support for this tendency can justify the application of natural-looking, wood-finish elements in the built environment that positively impact the overall well-being of the end-user population—and, in some cases, even boost productivity and enjoyment. In particular, new aluminum facade cladding systems can improve such outcomes, while also boosting durability and sustainability. They also can have an ameliorative effect in settings that tend to produce anxiety in many people. Woodgrain aluminum soffit and siding in a walnut finish add warmth and echo the patterns of nature, creating a positive environment for occupants.